The Marshall Islands include the Ratak (“sunrise”) and Ralik (“sunset”), two side-by-side chains of 29 coral atolls (an island that is made of coral and shaped like a ring), thousands of tiny islets, and hundreds of very small low-lying islands. The clear water surrounding the Marshall Islands is home to more than 1,000 species of fish and 250 species of coral, and it is considered one of the best places in the world to scuba dive. In October 2011, the government created the world’s largest shark sanctuary—an area covering nearly 772,000 square miles (2 million square kilometers) of ocean. Viona first realized that she wanted to sing in the third grade. Viona sang, too, but she sang very quietly. She didn’t like her voice, and she was embarrassed that other people might hear her. She didn’t know much about God, but she had heard Grandfather sing that God answers prayers. So, she decided to find out if God was real by asking for something special—a good singing voice. She didn’t know how to pray, so she simply spoke to God in bed at night. “What can I do to help my voice become good?” she asked. She prayed this prayer many times as she finished third grade at the local public school. Nothing happened. She persisted in the four and fifth grades, “What can I do to help my voice become good?” Still nothing happened. Viona grew angry, and she wondered whether God was real. But she refused to stop praying. Viona didn’t know it, but she was behaving just like a woman in one of Jesus’ parables in the Bible. Jesus told of a widow who asked an unjust judge for help. The judge refused to help her. The widow went to him a second time, and again he refused to help. The woman kept asking for help until the judge exclaimed, “Because this widow keeps bothering me, I will see that she gets justice, so that she won’t eventually wear me out with her coming!” (Luke 18: 5; NIV). Jesus said that people should be just like this widow: “They should always pray and not give up” (Luke 18: 1). That’s exactly what Viona did. She prayed and did not give up. When she was in the eighth grade, she was invited to join a church choir. She and other choir members spent hours rehearsing songs for the church service. “I practiced and practiced and practiced all the time,” she said. Then one day she noticed suddenly that her voice had changed. It was beautiful. She remembered her prayers, and she thanked God. When she finished eighth grade, she moved to the U.S. state of Oklahoma to live with relatives and attend ninth grade. For tenth grade, she moved back to the Marshall Islands and into her parents’ home on Ebeye [pronounced EE-by] Island. She enrolled in the Ebeye Seventh-day Adventist School. During a school week of prayer in 2016, Viona decided to give her heart to God and be baptized. She is the first Seventh-day Adventist in her family. Viona told him that her beautiful voice was an answer to prayer. She tells everyone that God is real and answers prayer. “I thank God that He answered my prayer,” she said. Part of this quarter’s Thirteenth Sabbath Offering will help Ebeye Seventh-day Adventist School carry out urgent repairs to its crumbling classrooms. 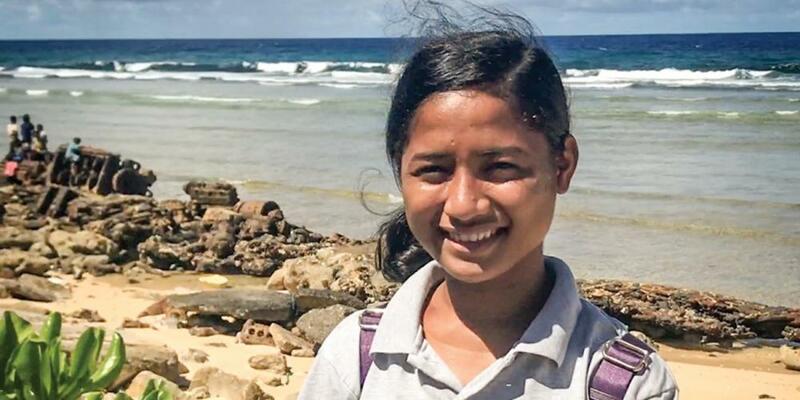 Thank you for your mission offering that will help students like Viona learn about Jesus.